Ever wondered how rubber bands are made? Quite likely not, but by now (hopefully) we’ve sparked your curiosity. The journey from rubber tree to the little stretchy piece of coloured rubber ring wrapped around the end of the plastic bag holding your drink, desert, or noodle soup is a complex affair. Seven separate processes are required from tree to your plastic bag sealer. About one hour’s boat ride from Mawlamyine (formerly Moulmein), Myanmar’s fourth largest city some 300 kilometres (about 186 miles) south east of Yangon, visitors will find Bilu Kyun, an island roughly about the size of Singapore. Also known as Ogre Island, Bilu Kyun is home to just 200,000 people spread across 78 village. With a new road bridge making the island more accessible, the skills of the Mon artisans on the island are rapidly seeing it develop as a local tourist destination. As foreigners are not permitted to stay on the island overnight, it’s a matter of cramming as much in as possible in one day, before the last boat/ bus leaves off the island. As can be seen in the video above, the process of making a rubber band begins with raw latex collected from rubber trees. The sticky white sap is first boiled, and dyed various bright hues. The Mon artisans then dip a wooden dowel with a rounded edge into the viscous liquid, with practice showing that dipping four times will achieve the optimal thickness for rubber bands. The dowels are then stood in the sun to dry. 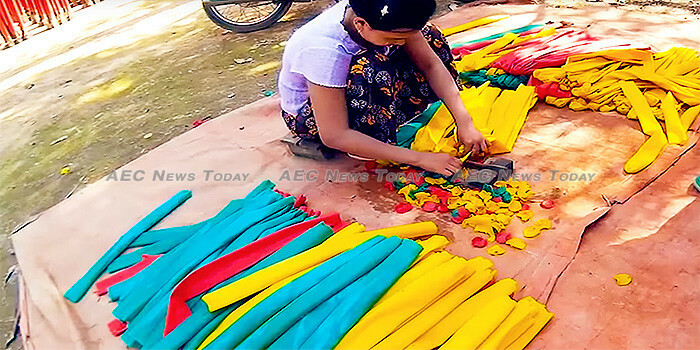 The artisans, who are often also the rubber farmers, peel a long, thin sleeve of brightly coloured rubber from each dowel, which is left for further drying before being fed through belt-driven machines to slice them into thin sections. The Bilu Kyun village women then slice and sort millions of the colourful rubber bands every day, before shipping them off to wherever rubber bands are needed most. From raw latex to rubber bands — boiling, dyeing, dipping, drying, peeling, drying again, and slicing — takes two days. In addition to seeing how rubber bands are made, tourists can also see local Mon artisans weaving fabric, making coconut-fibre mats and slate tablets, and handcrafting souvenir items using methods that have changed little over the years. Take in some of the sights of Bilu Kyun and see how that rubber band got from a rubber tree to around your plastic bag.